You'll be hard-pressed to find any professional singer in the world that naturally, has as much "Dean" going on vocally, as Frank Lamphere. Really! Here at Rat Pack Enterprises we are apprehensive about using the term "Impersonator" when referring to our Dean Martin performance. Have a look around the internet and what you'll mostly find are entertainers that may resemble Dean (most at least have dark hair) and that sing his songs accompanied by background (karaoke without the words) tracks. End of similarity! Does your event deserve better than that? 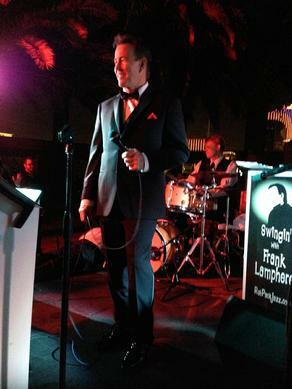 Professional singer-entertainer of 20 years, Frank Lamphere, sings Dino and is very similar. He vocally captures lots of the ultra-particular Dean Martin inflections, distinctive note bending, "Italian-ness" and style that made Dean a great singer. Close your eyes, listen carefully and for many, it's Dean. Especially if Frank wants to "pour-it-on". Which Lamphere does very well, with a classy, live band of 3 to 17 musicians. And no, the charts purposefully are not identical to those that Dean Martin recorded from. That, in our opinion gets back into "karaoke" territory. Like Lamphere's renditions, the band makes these songs, their own as well. (As they would have done in a Dean Martin nightclub performance) Very refreshing! Dean Martin Tribute Show. A 45-90 minute homage to one of America’s most popular entertainers ever, Dean Martin. Lamphere, who performs this show with an all-star band, has been a standout perfomer on the jazz music scene for years. Frank's long list of credits include: headlining act at the Chicago Festa Italiana, performances in New York, Las Vegas, singing for television commercials, fronted the jazz trio at the “5” star Peninsula Hotel, singing in front of thousands at United Center and U.S. Cellular Field, and concerts in Milan, Italy. Lamphere brings to this show, a great admiration for this classic music genre and especially for his favorite singer, Dean Martin. The show features Frank's sharp historical perspective, some good laughs, awesome musicianship and certain vocal characteristics that at times, make him sound very much like Dean. When singing Dean Martin songs, Frank Lamphere sounds like Dean, singing his own songs, a few months after having recorded them. Make sense? 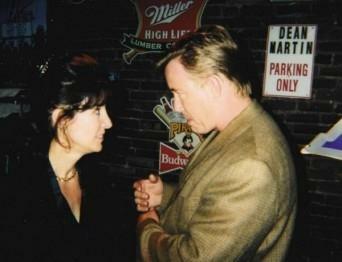 Frank Lamphere chats with Deana Martin at the Dean Martin Festival in Steubenville, Ohio. Click on the photo to go to Deana's website.